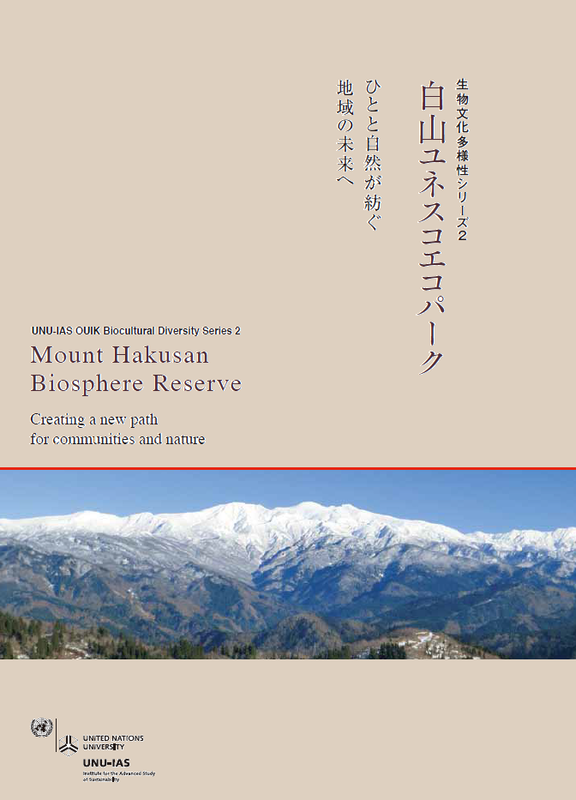 OUIK holds international symposium “Learning for Biocultural Diversity: UNESCO’s Biosphere Reserves”, on 11 May 2016, to memorize the second booklet launching of the series on biocultural diversity “Mount Hakusan Biosphere Reserve: Creating a new path for communities and nature” coproduced with local management body, the Mount Hakusan Biosphere Reserve Council. In order to conserve and evaluate biodiversity and cultural resources at local level, international organization such as UNESCO and several Multilateral Environmental Agreements has established global networks since 1970s; World Heritage sites, Ramsar Convention sites, Globally Important Agricultural Heritage System sites, UNESCO Global Geoparks, UNESCO Creative Cities and UNESCO Biosphere Reserves. These are international frameworks supporting for sustainable community management using natural and cultural resources. OUIK’s activities on biocultural diversity aim at collecting and analyzing the local site’s practical experiences to contribute international discussions within UN process, targeting to provide creative solution model of global issues from local level. As a part of multi level dialogue, OUIK invites Dr. Noëline Raondry Rakotoarisoa, chief of section on MAB networking, Division of Ecological and Earth Sciences, UNESCO, to discuss on collaboration and mutual learning between local activities and global movement through a case of global network of biosphere reserves, which aims at conserving ecosystem and biodiversity covering 669sites in 120 countries in the world. Ideas on OUIK’s booklet as a mutual learning tools will be exchanged. In the following workshop, the role of management staff of Japan Biosphere Reserve Network will be discussed for biocltural diversity conservation contributing to future international collaborative work. Participants: Dr. Noëline Raondry Rakotoarisoa (Chief, section on MAB networking, Division of Ecological and Earth Sciences, UNESCO), Management staff of BR sites in Japan, etc. Received a PhD in Ecological Sciences from the Université Paul Sabatier in Toulouse, France. Researcher and lecturer on plant ecology at the Universities of Mahajanga and Antananarivo in Madagascar, during which she worked as coordinator of the Mananara Nord Biosphere Reserve from 1994 to 1999. Thereafter, worked in UNESCO field offices in Africa after joining the UNDP. Assumed current post from 2011 at UNESCO Headquarters.